Our overall fundraising goal for the 2015-16 school year is $325,000. 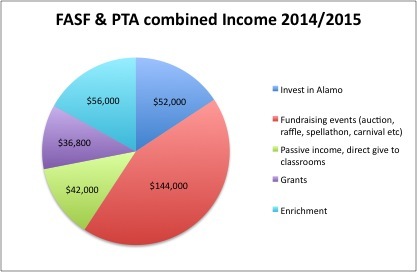 Thanks to the generosity of Alamo families, our PTA and Friends of Alamo School Foundation fund a wide range of programs that are not funded by the school district. These programs include technology in the classroom, music, physical education, literacy and library supplies, Education Outside/STEM, field trips etc. Your donations help improve the quality of our children’s education at Alamo. Your donation may be matched by your company. This will double the impact of your generosity! Please check this list of companies that match, or ask your HR department. All donations are fully tax deductible and every family who makes a donation will receive a beautiful Alamo tote bag.